Tripp Lite's VESA-compliant DWT60100XXTilt Flat-Screen Wall Mount's low-profile design features an open frame for easy wall access and optimal flexibility for display positioning, allowing you to effortlessly reposition your display at any time, even after installation. It is ideal for freeing up valuable space in your workstation. The DWT60100XX packs a lot of functionality into an unobtrusive frame. It has a tilt adjustment with a wide range of motion (-15° to 15°) for improved viewing angles in applications where the audience is located below the display. Its durable, all-metal construction with scratch-resistant, powder-coat finish supports up to 350 lbs. 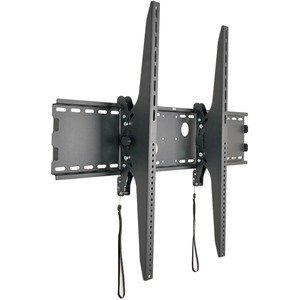 and fits most 60" to 100" flat-screen displays. It comes with all the necessary mounting hardware. To help you install it perfectly, the DWT60100XX features a horizontal adjustment to compensate for off-center wall studs. For peace of mind, the DWT60100XX comes with a 5 year warranty.